real wood furniture, small flower pots on the corner of a table, or trees to sweeten the room, give a natural touch to your workspace. Not only beautifying the scenery and not harmful to health, natural trinkets are never out of date. Don’t work in a room that is too dark and opaque. Give enough lighting for your workspace. Use table lamps when you work at night in a quiet and dark house. The dim lighting, besides being not good for eye health, will make you sleepy quickly. To add to the lively workspace, choose lights with unique designs. If you have limited space, every detail becomes a focal point. Try to minimize the amount of furniture with a built-in workbench with lots of drawers and loads of objects. Don’t ignore the plain wall, which has the potential to be a superfunctional space for bookshelves, pictures, and various knick-knacks. Continuing point 2, everyone knows, the existence of plants is able to clean the air, make the body and mind fresher, reduce stress, and stimulate the brain to work better. So, making “greening” in your workspace is highly recommended. Some flower pots will definitely give a fresh touch to the interior of your work. Plain, drab walls. Decorate the walls with photos, posters, memos, post-it notes and reminders. In addition to enlivening the work atmosphere, some items such as a reminder board will help your work. You can also put up a painting or sentence that gives encouraging quotes. Decorate your workspace with a specific color theme. 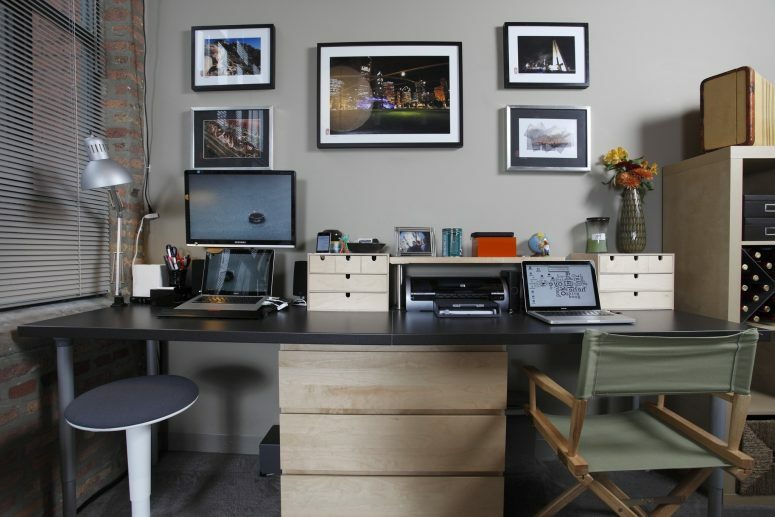 Try to make the furniture, trinkets, displays, and color of the walls of your workspace similar. Color choices according to taste that reflect your personality will make you comfortable and enjoy lingering in the workspace. Don’t overdo it with trinkets. Put only functional objects so that the workspace doesn’t seem crowded and messy. For example, choose only one favorite pillow to just lean or hug. Don’t put too many pillows because you have to work, not to sleep right?